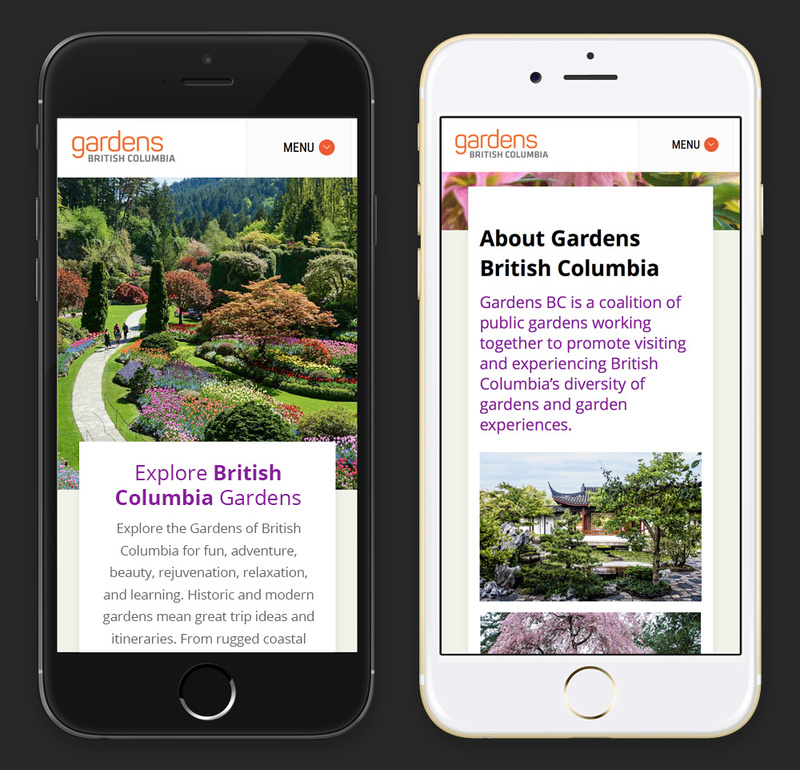 In addition to designing Gardens British Columbia’s new identity, Gardens BC was looking to launch a robust website featuring their new look. The site’s primary objective is to showcase the diversity and beauty of the province’s gardens, the primary audience is tourists with a secondary audience of local residents. 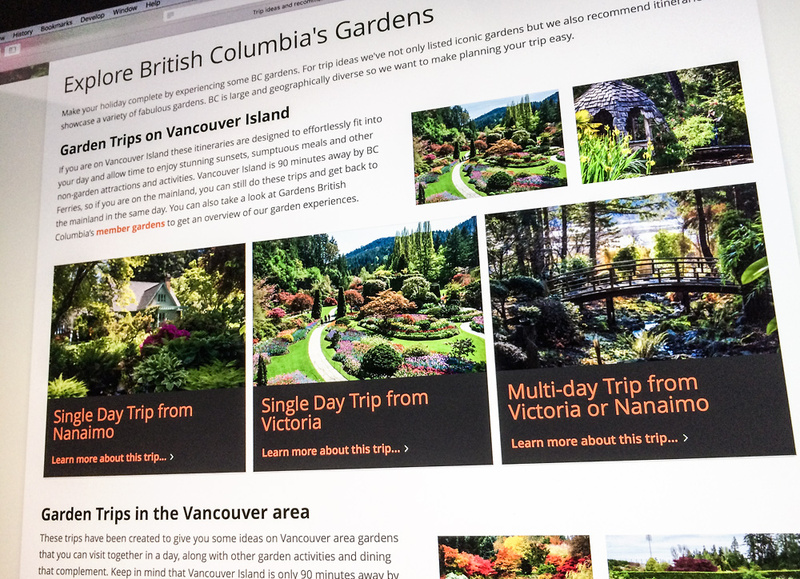 The fully-responsive website incorporates a province-wide garden directory with planned trips with their Member Gardens at the forefront. 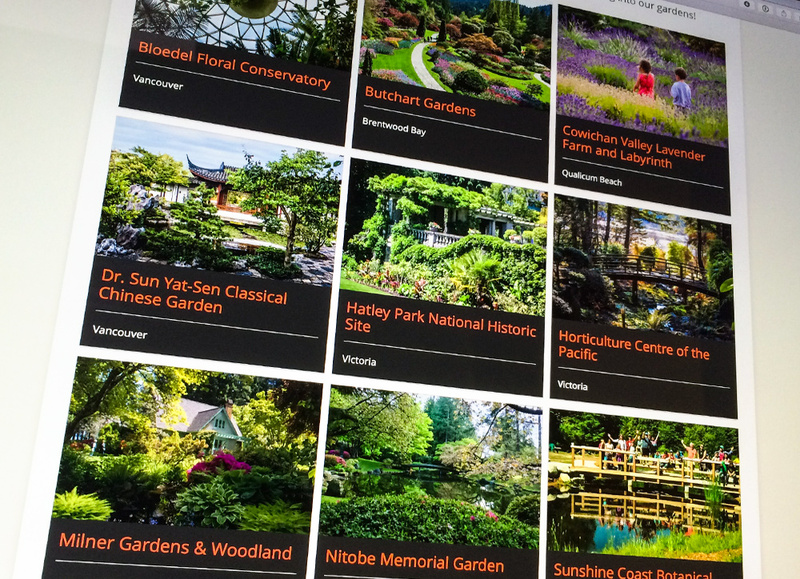 The website brings together top-tier tourism destinations such as The Butchart Gardens in Victoria, Dr Sun Yat-Sen Classical Chinese Garden in Vancouver, as well as featured partners including Communities in Bloom; which work with communities beautifying public spaces in cities and towns across Canada. Each member and partner garden has a feature page that provides general information, photos, video, contact info, and social channels. The site also features Events and News sections to showcase seasonal highlights, awards, breaking news and upcoming events. 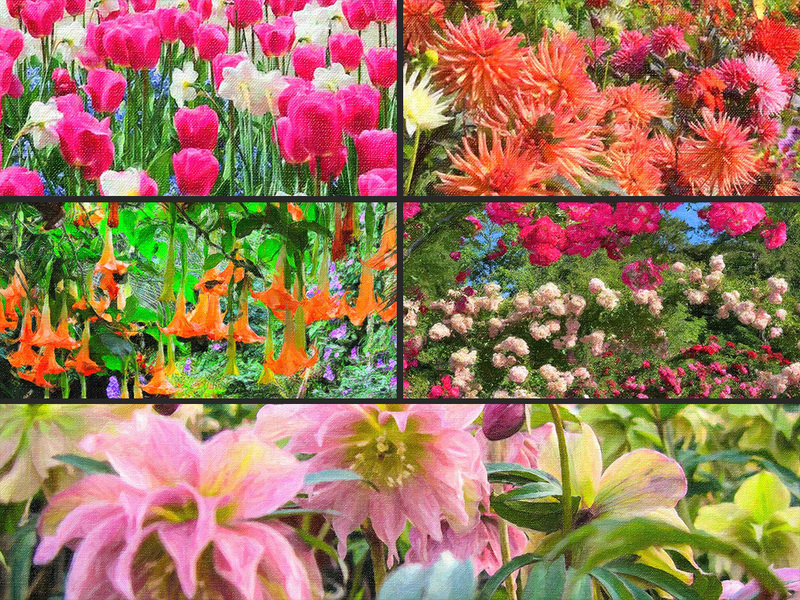 The front page features three randomly loading Member Gardens and a footer that pulls together events from all the gardens as well as the latest garden news. The website was made to be a useful tool when you’re out on the road and need to look something up – and performs well on mobile devices. Each Member Garden gets their own page on the website. These pages are designed to be a clean and consistent layout to let the natural beauty of individual gardens shine through. Each garden page features rich descriptions, a photo library, video and customizable sections to showcase amenities such as wedding and special event rentals as well as news and events for each garden. Member Gardens appear together on the Gardens’ directory. 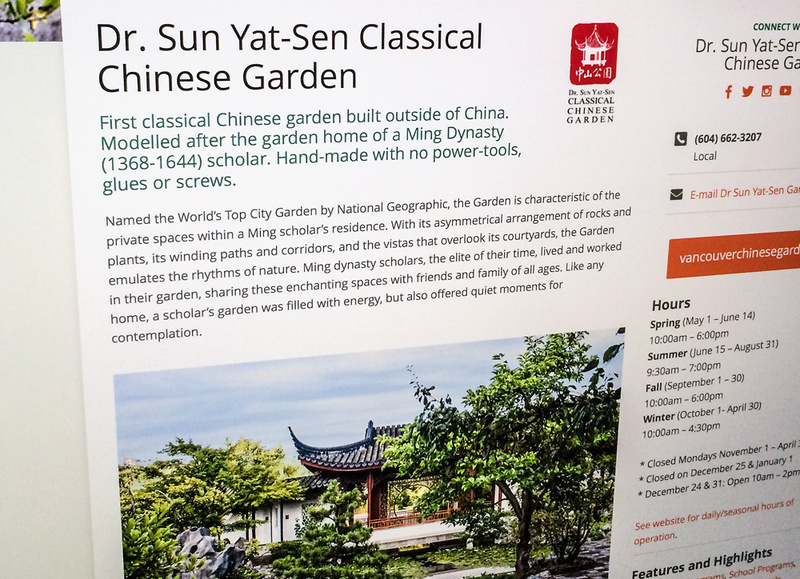 Dr Sun Yat-Sen Classical Chinese Garden’s Member page. Lightboxed photo from the Dr Sun Yat-Sen photo gallery. 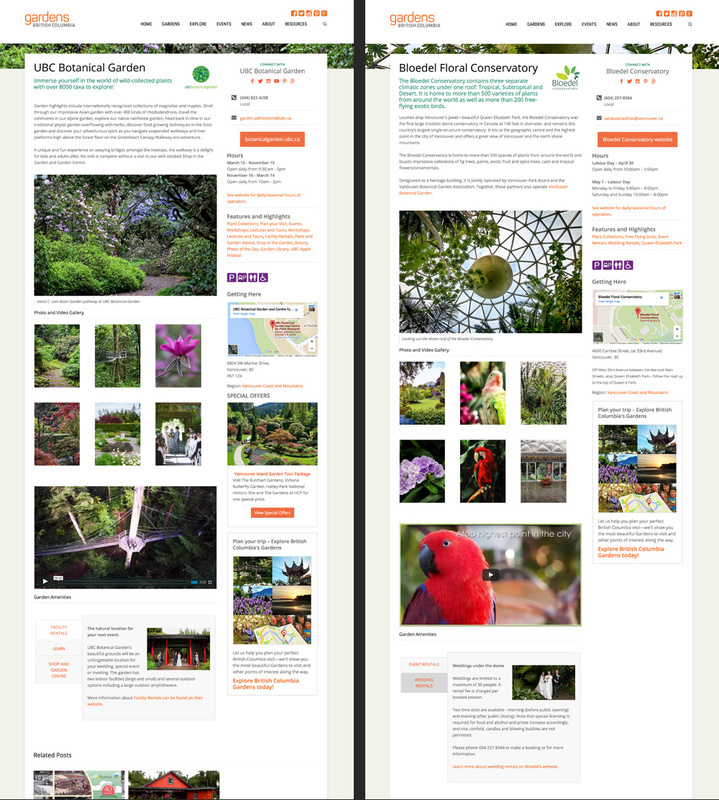 UBC Botanical Garden and the Bloedel Floral Conservatory Member pages side-by-side; different garden’s information appears consistently across all the pages. 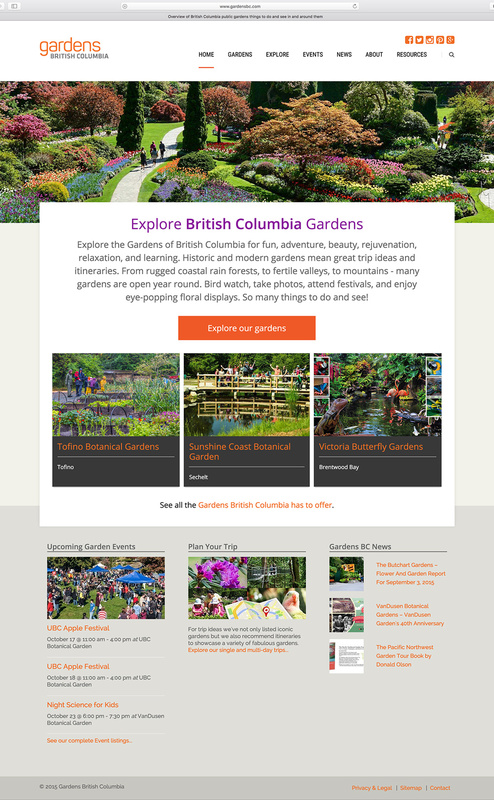 The Explore page of the website is an evolving section of the website that has launched with a handful of curated single day and multi-day trips from around Nanaimo, Victoria and the Vancouver area to create botanical and cultural tours. We purposely mixed in local flavour and cultural experiences alongside trips to Member Gardens, to create well-rounded trips that we felt the target market would enjoy. Trip information is provided at the top of the page so that visitors know how far and how long the trip will take. Gardens BC is looking at expanding more customized trips in the near future. I was happy to share some photos for this section that I’ve shot over the years as my wife and I often stop at gardens when we travel. 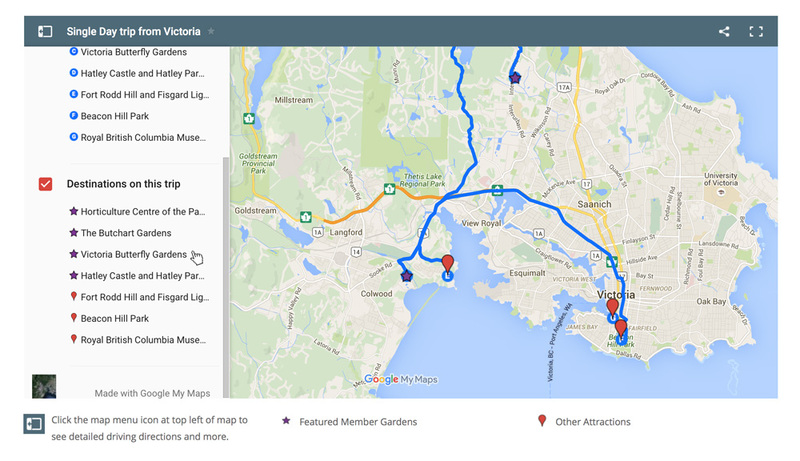 With Google Maps integration built-in on each trip page, it works great on mobile and was designed to aid visitors when they’re out on the road. Single and multi-day trips on Southern Vancouver Island. This Single Day Trip from Nanaimo page is a good example of all the places you could visit in about 6 hours, and has places of interest for people of all ages. A Single Day Trip around Victoria map makes the most of your day, wrapping up at the Royal British Columbia Museum and dinner on the town. 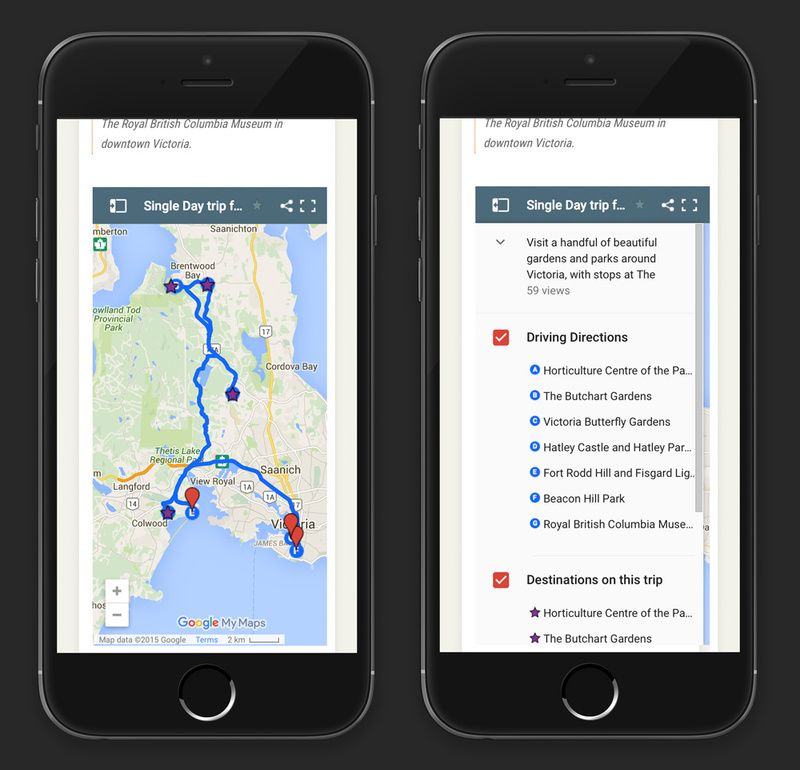 The trip pages with integrated Google Maps are meant to be used while you’re out on the road; quickly change your destinations on the fly if you’d like to. 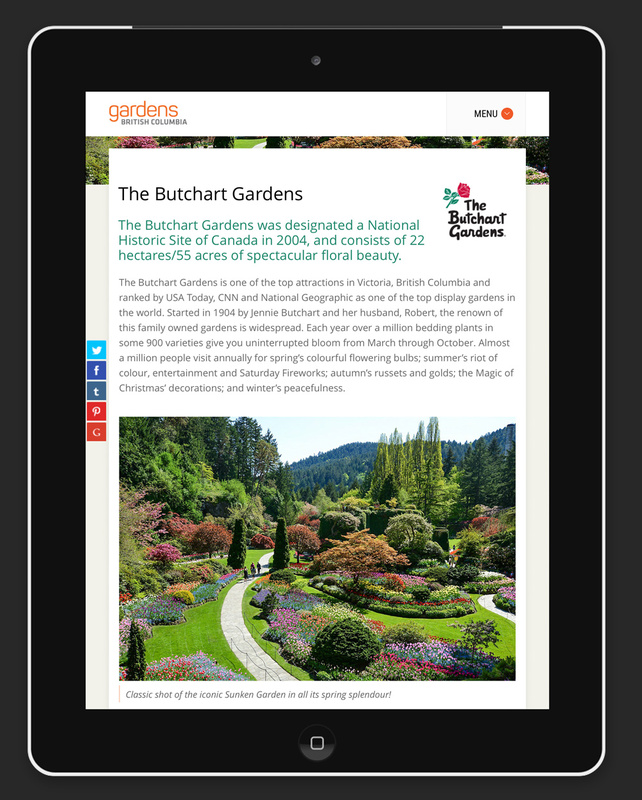 The Butchart Gardens Member Page displayed on an iPad. 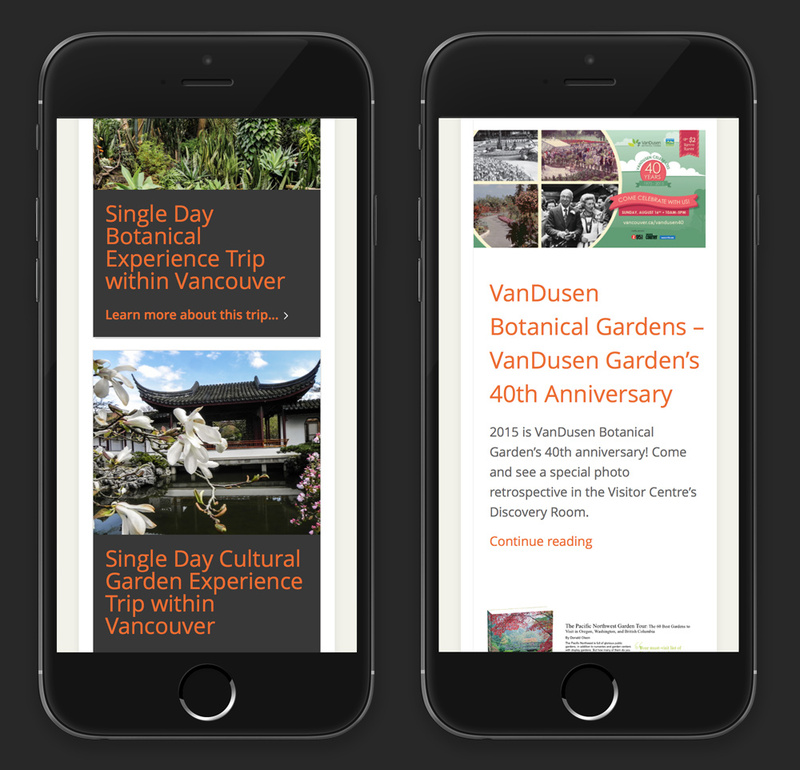 Explore Page trips and Garden news as it appears on an iPhone. Detail of some of the ‘painted’ background header images I created using Alien Skin’s SnapArt plugin. 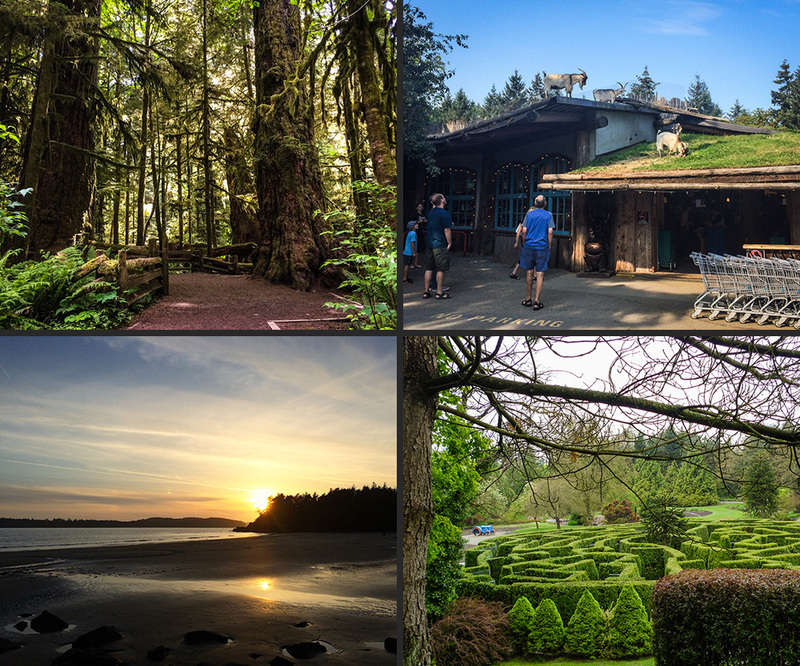 A few of my photos that I contributed to the website; Cathedral Grove at MacMillan Provincial Park, Goats on the Roof at the Old Country Market in Coombs, a sunset in Tofino and the maze at VanDusen Botanical Gardens.